My dear friend and neighbor Erin tore across the street last week, clutching the beloved Christmas stocking that her grandmother had knit for her almost forty years ago. Knowing I’m a knitter, Erin hoped I was also a knitting mender. Somehow several stitches of Grandma’s stocking had worked their way loose, creating a little hole at the top that brought Erin to a bit of a panic. Fortunately for me, the repair was super easy as I simply worked the dangling strand of yarn through those old loops with a crochet hook and wove in the yarn end. Stitches re-created; disaster averted, family tradition maintained. I have some knitted heirloom stockings of my own hanging in front of my fireplace. One is a striking, very long red-and-white affair with a Santa knit into the center of it with angora. 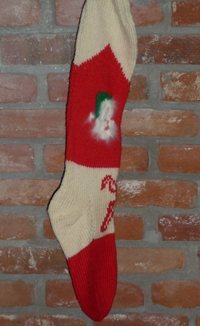 [And while mine is pretty long, it doesn’t come close to the Guinness World Record’s largest Christmas stocking, which apparently measured over 168 feet in length and almost 71 feet in width (heel to toe), knit by an emergency services organization in Tuscany, Italy, last year.] My father hung up my long fuzzy stocking as a child himself, and it’s been part of his family’s Christmas tradition for so long no one remembers its history. My sister hangs the matching green-and-white one at her house. I have another one with my name knit into it by my mother’s best friend and that stocking is older than my friend Erin’s! A dozen years ago, the same dear knitter made one for my son that matches mine. It’s sweet to hang our stockings up together that were made for us by the loving hands of the same woman decades apart. It seems that when we hang our stockings up each year, it preserves a connection to our families, even if they have long since left us or live a thousand miles away. I’m thinking not only of my friend Erin and myself, but of many friends’ stories I’ve heard, and in particular a beautiful article by Barbara Bentley in PieceWork’s November/December 2003 issue, “My World War II Christmas Stocking.” This story details the life of Barbara’s grandmother who knit Christmas stockings for all eleven of her grandchildren and a special one for Barbara at the start of the second World War. If you’d like to knit an heirloom for someone special in your life, you’ll surely be able to find a pattern during Interweave’s December sale. 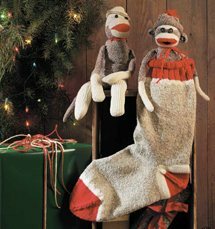 Whether you’re searching for a whimsical sock monkey stocking, a Celtic Fair Isle stocking, or something elegant and lacy, you’ll be able to find a design in the Christmas Stocking eBook. 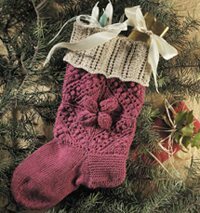 Search the Interweave store and you’ll find other Christmas stocking patterns and fabulous handmade needlework gift ideas aplenty. And remember with that Christmas stockings, you only have to knit one!